On the face of it, using the Nik Collection in Lightroom appears simple. You find the photo you want to edit. Right-click with your mouse. Select “Edit in” from the popup menu and pick the Nik plugin you want to use. But if this is how you’re using the Nik Collection in Lightroom, you’re probably missing out. In this article I’m going to explain how you can improve your workflow and make life easier for yourself by using some of Lightroom’s features. If you want to learn more about using the Nik Collection, visit the Lenscraft Nik Collection Tutorials page. If you want to know how to use the Nik Collection in Lightroom, watch the following video. I also demonstrate this and everything else covered by the article below. To ensure you never miss a video, you can subscribe to my You Tube Channel. I post a new video every week. Let’s take a simple example where you pick a photo to edit in Lightroom and select to edit it using Nik Analog Efex. When you do this, the first thing that happens is that you’re presented with Lightroom’s Edit Photo dialog. This confuses a lot of people as the natural assumption is that this is part of the Nik Collection, but it isn’t. This is a Lightroom dialog used to control the image file that’s passed to the Nik plugin or editor. If you want your photos to have the highest image quality, you need to choose these options carefully. Often the default values in this dialog aren’t the best and you need to change them. After you’ve done this a few times it becomes quite repetitive and wastes time. If you’re finding this a problem, you can change the default configuration of this dialog for each of the filters. You do this in the “Lightroom Preference” dialog in the “External Editing” tab. I’m not going to explain the detail of how to do this now, but it’s covered fully in the video later. Yes, I went to the trouble of producing a video to accompany this piece. If you look back to the screenshot of the Edit Photo dialog you will see that only one of the options is available. This happens when the file you’re editing is a RAW file. Image editing software like Lightroom will never edit a RAW file directly. Instead, it will convert the RAW file to an image (in the TIFF, PSD or JPEG format) and apply any adjustments you have made. 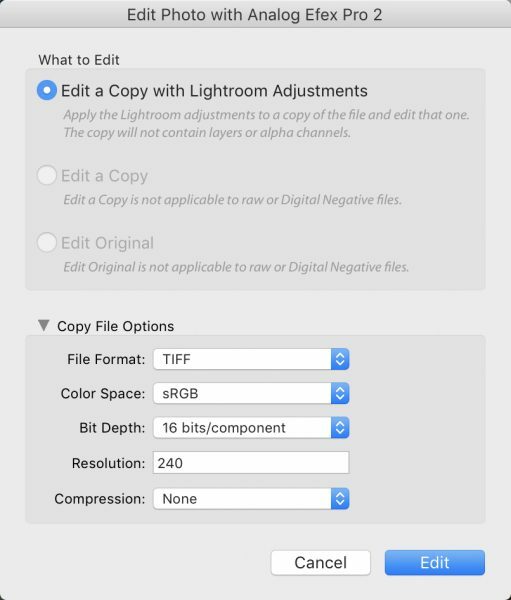 Therefore, we're forced to use the option “Edit a Copy with Lightroom Adjustments”. When the conversion takes place, the “Copy File Options” control the file that’s produced and passed to the Nik Collection plugin. The other two options in the dialog become available when we’re editing an image file like a TIFF or JPEG. The “Edit a Copy” will produce an exact copy of the image. The copy passes to the Nik Collection plugin for editing. 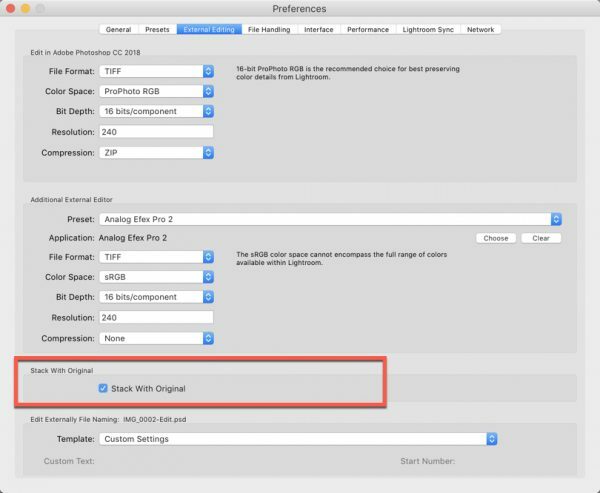 This preserves the “original” image file, and if you intend to use several Nik Collection filters, this can be useful. Retaining multiple versions of your image allows you to return to a previous point in the editing without needing to process everything from the start. Think of it as a type of history and insurance. The third option in the dialog is to “Edit Original” where you will edit the original image. This runs the risk of wasting a lot of editing time if you find you want to go back to change something. The upside though is that it reduces the number of versions of an image produced. 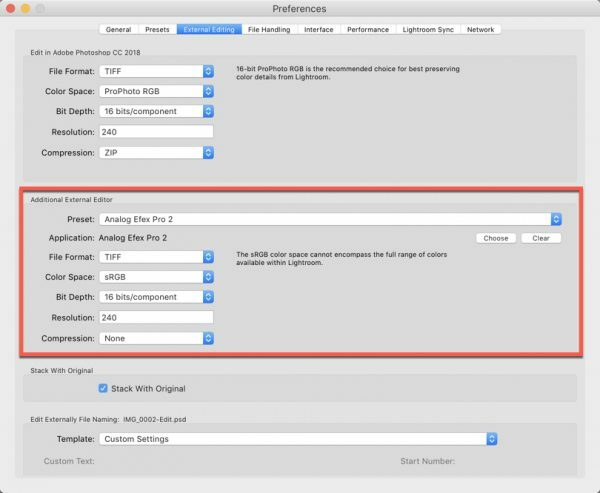 If you’ve been using the Nik Collection in Lightroom for some time you may already be frustrated by the number of versions of an image file produced. This happens each time you select to edit a photo unless you select the “Edit Original” option mentioned above. One Lightroom feature that can help you better manage your new image files is image stacking. Using image stacking in Lightroom it’s possible to group multiple related images together as shown here. When you create an image stack, you can expand or collapse the stack. If you collapse the stack by clicking the number in the top left of the thumbnail, the Lightroom Library module only displays the top image. When you click the number a second time you can expand the stack to see all the images. It’s even possible to drag and drop the images in a stack to reorder them and choose which one you want to appear on top. The image stack is a great way to group multiple versions of the same image together. Best of all, you can configure Lightroom to automatically create an image stack when generating new image for editing in the Nik Collection. You can do this by clicking the “Stack with Original” option in the Lightroom Preferences dialog. You can see this indicated in the screenshot below. Did you know that when you use the Nik Collection in Lightroom, it’s possible to select and edit multiple images? By holding down your Ctrl key or the Cmd key on a Mac, you can select multiple images in the Lightroom Library module. Now when you select to edit one of these, Lightroom passes all the images to the chosen Nik Collection plugin. Once you’re in the Nik plugin, you will see a couple of new buttons appear at the bottom of the interface as shown here. You can use these buttons to move through the images you’re editing in sequence. Simply apply your adjustments to the first image and then click the Next button. If you decide you want to go back to an earlier image in the group, click the Previous button. Once you have made all your changes, click the “Save All” button to save the changes and return to Lightroom. So far, we have only looked at using the “Edit in” option from the popup menu to launch a Nik editor. All the Nik Collection plugins are used in this way except for Nik HDR Efex. To launch Nik HDR Efex Pro you need to use the File menu in Lightroom. Here you will find the option “Export with Preset” and within that, “Nik HDR Efex Pro 2”. This will open the image or images for editing. If you select multiple images for editing, HDR Efex Pro assumes you want to merge them to an HDR image first. If you only select a single image for editing, it doesn’t open the Merge dialog. 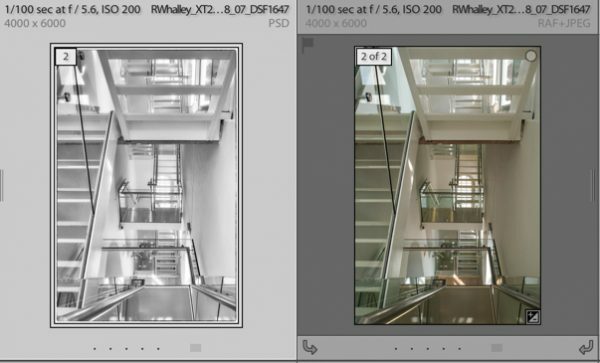 Instead it opens the image in the HDR Efex Pro Tone Mapping module. Although you can launch the HDR Efex plugin from the File menu, this doesn’t have to be the case. It’s possible to configure Lightroom so the HDR Efex plugin is available from the “Edit in” popup menu along with the rest of the Nik Collection. If you’re using the Nik Collection in Lightroom, I hope this article has given you some useful ideas and tips. There’s much more power available to you than just opening a single file with the “Edit in” popup menu. You just need to spend a little time configuring Lightroom. If you found this tutorial valuable, please share it with others. You might also like the tutorial Making Selective Adjustments with Nik Control Points. Thanks. That makes sense of what I am seeing. I was misled by the documentation online which says “Can I use the RAW Presharpener for my TIFF files? Yes, I think that is misleading. I have never known the Presharpener to be able to save the results of a RAW file and I’m not convinced it’s even reading the RAW file data. Perhas there are some RAW files it can work with but I’m not aware of this. I have noticed that the interface to the NIK RAW Presharpener is the same as the others in Lightroom, namely that LR passes it a TIFF file. Doesn’t that mean that the RAW processing is done by Lightroom (and the “gold standard in RAW processing” claims on the DxO website become irrelevant)? That’s correct otherwise I would expect it to show up under the “File | Plug-in Extras” and say something like transfer to Nik… If you’re going to use the Nik Presharpener Pro, it’s often a good idea to turn off the Lightroom capture sharpening. I haven’t seen the “Gold standard” claim in relation to the Nik filters. Are you sure they aren’t refering to DXO Photolab? I guess the gold standard claim is for Photolab – their page merges every together: Photolab, Nik, U Point. I started looking at Nik when I compared the out-of-camera B&W from my Olympus EM1 with B&W conversion in LR and thought I saw more detail from the Olympus processing. Then I realised LR passed a tiff to PreSharpener, rendering it pointless to use it. I found you can drop the RAW directly onto Presharpener and it will work but then will fail on the last 5% of the save process, so it needs to be called from something. I’ll try the DxO Photolab next. Hi James, you’re right about the Nik products needing a host application, at least when processing a RAW file. You can use them stand alone but they just try to write updates back to the file. As it’s a RAW file, they can’t do this. Also what I believe you are seeing when you try to edit a RAW file directly in Nik is the embedded JPEG preview rather than a redering of the RAW file. I suspected this and the evidence from editing a Fuji RAW file seems to support it. When using the Fuji RAW file the image in Nik appears at 50% the size it should be (which is in line with the Fuji embedded preview). I think you will find PhotoLab is better.